It was a great pleasure for the rural kids. Kids who prepared themselves round the year for the next day’s class lessons; competed with the classmates for a bright result; at a time helped their parents in the crop-fields, fishery-ponds, caring family pets, attended family small shops, kitchens, kitchen-gardens; hunch-backed with the heavy school-bags and got puzzled with jam-pack home-works — get a tremendous space of enjoyment and self-purification. Also, they adorn themselves with patriotic spirit to face the new-year challenges by marching boldly with truth and beauty. Future of the nation obviously depends on them. Rabindranath Tagore says, `Every child comes with the message that God is not yet discouraged of man.’ Nelson Mandela utters boldly, `There can be no keener revelation of a society’s soul than the way in which it treats its children.’ If we can foster our kids sincerely and grow them up as a healthy and educated citizens then a bright and prosperous future will be a must for our nation. But the woeful truth is that, most of our kids are not getting the opportunity of proper education, let alone cultural support. Education is a right, like the right to have proper food or a roof over your head. Article 26 of the 1948 Universal Declaration of Human Rights states that “everyone has the right to education”. Education is not only a right but a passport to human development. It opens doors and expands opportunities and freedoms. It contributes to fostering peace, democracy and economic growth as well as improving health and reducing poverty. 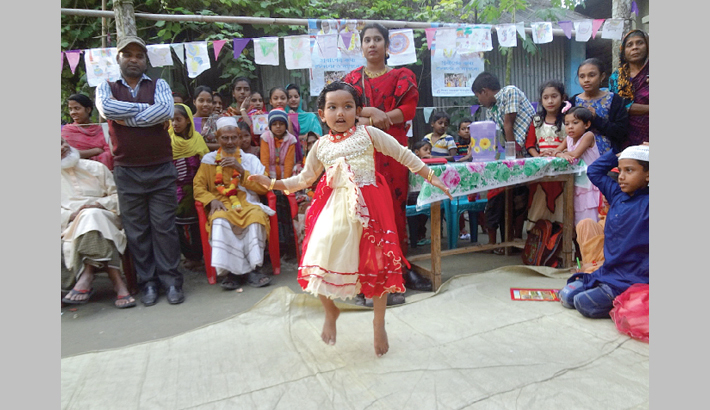 CDIP (Centre for Development Innovation and Practices), a self-funded non government organisation of Bangladesh, realized that in order to develop our nation, educational support to the kids of depressed and illiterate family is crucial. Their social commitment attracts and then involves the rural mass of their working area in this programme. The most positive achievement of their program is— they managed to involve the rural people with their various activities. Their teachers of learning centre foster the poor-family kids and the villagers foster the learning centre. First they began this program to address the drop-out kids from the primary school in March, 2005. Success in this regard inspired them to take more positive steps. They include healthcare practices, cultural activities, respecting the elderly people and nature study for the kids. As Albert Einstein says, ` Look deep into nature, and then you will understand everything better.’ William Shakespeare says, `One touch of nature makes the world kin.’ Thus CDIP includes Nature Study in its Education Support Program in 2015 in order to introduces the Nature to the children as well as to learn from it. They also enjoy the day of their Nature Study playing in the Nature, knowing the names of trees, birds, fishes, animals, flowers, fruits, engages in creative activities with lieves, flowers, buds and also come to know which one is helpful and which one is harmful. Children of the organisation’s 2400 Learning Centres are practicing it once in a month. Cultural programme for the rural kids enhance their positive thinking and activities. The kids of disadvantaged families of the rural area gather to their respective learning centers on the scheduled day much before the scheduled time. They help their teachers to arrange the program, welcome the oldest woman and man with flower, take them to the stage, pay obeisance by touching their feet. The blessing hands of the oldest guardians of the village bestow them good wishes. In the meantime the chief-guest, guests and the president, who are selected from the village guardians arrive and take their sits on the stage. Then the teacher announces the commencement of the cultural fest. The kids recite, sing, perform in playlets, dress as the like, dance and play. Soon after the kids’ performance, they are given prizes, sponsored and arranged by the villagers.